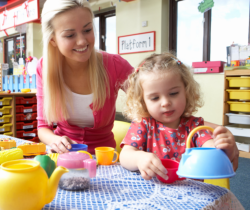 Our team is full of creative and wonderful teachers ready to help your child develop independence, creativity, positive relationships, artistic expression, responsibility, confidence and respect. We are integrating families together, communicating and interacting with families, building a team between teachers and families. Kids Steps Academy teachers are always ready to give more! The relationship between teacher and students at Kids Steps Academy is based on daily routines filled with love and caring learning experiences. Our teachers are always willing to help the children build confidence and improve their learning skills. Kids Steps Academy teachers have all the certifications required by Florida the Department of Children and Families and they work every year on professional development trainings that allows them to keep an educational career in compliance with the standards of Early Childhood Education. Teachers are always planning monthly presentations for the parents, letting them enjoy all the learning that their children have achieved.